Seasonal times Festival: open until 8pm depending on events. Food served Mon–Fri 8.30am–3.30pm; Sat 10.30am–3.30pm; Sun 11am–3pm. A bright and spacious café serving a healthy, locally-sourced menu. 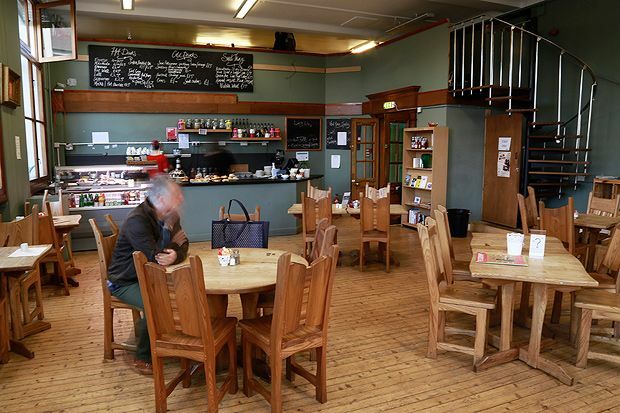 Summerhall has a reputation as a versatile venue that defies traditional expectations in the arts. The theme of the unexpected continues in the café – a wide-windowed, peaceful space providing a stark contrast to the building’s imposing exterior. The menu presents creative combinations that liven up lunchtime and show off fresh ingredients at their best. Miso aubergine, spring onion and chickpea toasted wrap is subtly spiced and deceptively filling, and comes nestled on a vibrant side salad dressed with a hint of aniseed. Soya bean, quinoa and avocado salad is a generous plate of well-matched flavours, layered with colour and interest until the final forkful. With a menu that changes seasonally and a gallery space showcasing a different local artist every six weeks, the café expertly demonstrates how to bring together elements of the unexpected with unwavering core values and consistently good food. Live entertainment: Used for Summerhall performances and events. Discuss life, death and what comes after. Please go to Eventbrite link to book your place.